Chatterton, Brian. "Trilobite". The Canadian Encyclopedia, 04 March 2015, Historica Canada. https://www.thecanadianencyclopedia.ca/en/article/trilobite. Accessed 22 April 2019. Trilobitesare an extinct marine arthropod of the Palaeozoic era (544-300 million years ago). Its closest modern relative is the horseshoe crab. Trilobites had 2 eyes on top of the head, antennae projecting from beneath the head and, in some, from under the tail, and 2 rows of paired limbs. Each paired limb consisted of 2 branches joined near the base: a comblike gill branch (exite) for breathing and swimming, and a jointed walking leg (endite). After hatching, each trilobite secreted a shell, composed mainly of calcite but with some calcium phosphate and organic material. The shell consisted of head and tail pieces (cephalon and pygidium, respectively) separated by several articulated segments (thorax). Adults ranged from less than 1 cm long (eg, genus Scharyia of the Mackenzie Mountains, NWT) to over 60 cm (eg, Terataspis of Ontario). Some trilobites were pelagic, swimming and floating near the surface of ancient oceans. Most were benthic, crawling on or plowing through seafloor mud, extracting organic particles from mud or filtering them from seawater through their comblike exites. Predatory trilobites apparently used sharp spikes on the undersides of their walking legs to clasp prey. Some could swim by using their exites as oars. Trilobites of genus Illaenus had smooth, hemispherical heads and lived in burrows, their heads acting as caps to the burrows if predators threatened. Seafloor dwellers left characteristic, grooved trails, or trilobite-shaped resting burrows. Trilobites appeared early in the Cambrian period. They increased in numbers and diversity and are used to date Cambrian rocks (544-510 million years old). A second period of adaptive radiation, early in the Ordovician (510-441 million years ago), produced all major post-Cambrian groups. Their number and variety dwindled until extinction at the end of the Palaeozoic era. They probably died out because they were unable to compete with or escape from active, aggressive fish. Trilobites were also preyed on by starfish, cephalopods, coelenterates, etc. Trilobite fossils are abundant from western Newfoundland to the Rocky Mountains, and from the 49th parallel to the High Arctic. 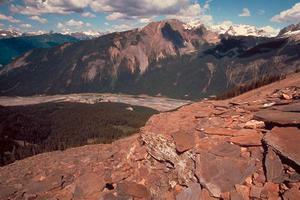 Their most spectacular occurrence is probably the Burgess Shale near Field, BC (a World Heritage Site). Here, the soft parts of trilobites and related arthropods are preserved: hence, the site has provided information on the relationships of trilobites to other arthropod groups. Specimens from the Canadian Shield are often beautifully preserved. Complete skeletons of Triarthrus eatoni and Pseudogygites latimarginatus from Collingwood, Ontario, and of Phacops rana from southern Ont are particularly well known and are prized by collectors. Specimens of giant Terataspis grandis and Isotelus maximus are also known from Ontario. Along the Hudson Bay in northern Manitoba the largest-known complete fossil of an Isotelus species was found. At 70 cm this fossil dwarfs the majority of trilobite fossils that range from 3-10 cm long. The Mackenzie Mountains contain a unique sequence of trilobite faunas, in which quartz has replaced the skeletons. This type of preservation is often so good that all the details are preserved on minute larval trilobites as small as 0.2 mm in length. Entire life cycles, from babies to large adults, are preserved in this fashion. There are more levels of silicified trilobites, spanning a greater amount of time, in this part of northwestern Canada than in any other region of the world. These fossils, which range from 350 to 520 million years of age, are used to study trilobite evolution, ecology and geographic distributions.